CONSORT indicates Consolidated Standards of Reporting Trials; and PICU, pediatric intensive care unit. Importance Clinical practice guidelines for managing infants and children hospitalized for bronchiolitis recommend only obtaining intermittent or “spot check” pulse oximetry readings for those who show clinical improvement. The effect of such monitoring is currently unknown. Objective To determine the effect of intermittent vs continuous pulse oximetry monitoring on hospital length of stay among nonhypoxemic infants and young children hospitalized for bronchiolitis. Design, Setting, and Participants Randomized, parallel-group, superiority clinical trial of otherwise healthy infants and children 2 years of age or younger hospitalized for bronchiolitis during the period from 2009 to 2014 at 1 of 4 children’s hospitals in the United States. Parents or guardians were blinded to allocation assignment until informed consent was obtained; study personnel and outcome assessors were not. Interventions Patients were randomly assigned to undergo continuous or intermittent pulse oximetry monitoring (ie, pulse oximetry measurements were obtained along with a scheduled check of vital signs or for clinical suspicion of deterioration) during hospitalization when oxygen saturation levels were 90% or higher. Main Outcomes and Measures Length of hospital stay was the primary outcome. Secondary outcome measures included duration of supplemental oxygen use and rate of escalation of care (defined as transfer to an intensive care unit). Results A total of 449 infants and young children were screened for inclusion; 288 infants and young children were excluded, resulting in 161 patients who were enrolled in the study (80 patients underwent continuous monitoring, and 81 patients intermittent). The mean length of stay did not differ based on pulse oximetry monitoring strategy (48.9 hours [95% CI, 41.3-56.5 hours] for continuous monitoring vs 46.2 hours [95% CI, 39.1-53.3 hours] for intermittent monitoring; P = .77). The rates of escalation of care and duration of supplemental oxygen use did not differ between groups. Conclusions and Relevance Intermittent pulse oximetry monitoring of nonhypoxemic patients with bronchiolitis did not shorten hospital length of stay and was not associated with any difference in rate of escalation of care or use of diagnostic or therapeutic measures. Our results suggest that intermittent pulse oximetry monitoring can be routinely considered in the management of infants and children hospitalized for bronchiolitis who show clinical improvement. Pulse oximetry is routinely used to monitor infants and children hospitalized with respiratory infections. For infants and children with bronchiolitis, it has been hypothesized that oxygen saturation level is the critical element in determining clinicians’ decisions about the necessity of hospitalization.1-3 Oxygen saturation level has been implicated as a prime determinant of length of stay (LOS) for these patients as well.4Quiz Ref ID Despite studies asserting the importance of monitoring the oxygen saturation level of patients with a respiratory infection, to our knowledge, no study has yet linked routine use of pulse oximetry to improved outcomes for patients with bronchiolitis. For hospitalized infants and children, pulse oximetry may be used intermittently or continuously. As part of a strategy for the rationalized use of pulse oximetry for the management of patients with bronchiolitis, the 2006 American Academy of Pediatrics (AAP) guidelines stated that continuous measurement of oxygen saturation by pulse oximetry (SpO2) was not routinely necessary for patients who show clinical improvement.5 The 2014 AAP guidelines further recommended using intermittent pulse oximetry monitoring of children hospitalized for bronchiolitis who are not receiving supplemental oxygen.6 However, the guidelines highlight the fact that the use of pulse oximetry for children hospitalized for bronchiolitis is not well studied. Avoidance of continuous pulse oximetry was also one of the recommendations proposed by the Choosing Wisely campaign for pediatric hospital medicine.7 To date, there has been no prospective evaluation of the effect of intermittent pulse oximetry monitoring on infants and children hospitalized for bronchiolitis. In the present study, we sought to compare intermittent vs continuous pulse oximetry monitoring strategies for infants and young children hospitalized for bronchiolitis. Our primary hypothesis was that intermittent monitoring would result in a decreased LOS compared with continuous monitoring. This study aims to determine the effect of intermittent pulse oximetry monitoring on the short-term outcomes of children hospitalized for bronchiolitis who show clinical improvement. Compared with continuous pulse oximetry, intermittent pulse oximetry did not shorten the length of hospital stay (mean length of stay, 48.9 hours [95% CI, 41.3-56.5 hours] for continuous monitoring vs 46.2 hours [95% CI, 39.1-53.3 hours] for intermittent monitoring, P = .77). Intermittent monitoring was also not associated with an increased escalation of care, diagnostic testing, or respiratory interventions. Our study was a randomized, parallel-group, superiority clinical trial of continuous vs intermittent pulse oximetry conducted during the period from October 2009 to April 2014 at 4 children’s hospitals (Figure 1; trial protocol in Supplement 1; eTable in Supplement 2). All of the hospitals (hereafter referred to as sites) used dedicated pediatric emergency facilities and physicians except for site 4, which used combined adult/pediatric emergency department facilities and primarily adult-trained health care professionals. All facilities accepted direct hospital admissions and served as regional referral centers for their respective geographic areas. Only 1 study site (site 1) used an institutional clinical practice guideline during the course of the study. Respiratory-distress scoring systems for hospitalized patients were sometimes used but were not standardized across sites. All sites used an oxygen saturation level of 90% or higher in room air as a criterion for hospital discharge. Quiz Ref IDInclusion criteria included (1) an age of 24 months or younger at time of admission; (2) hospitalization for acute bronchiolitis, defined as wheezing and/or increased work of breathing associated with signs and symptoms of an upper respiratory tract infection; and (3) being screened and enrolled within 24 hours of hospital admission. 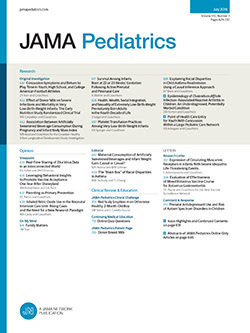 We excluded infants and young children at higher risk of clinical deterioration and those not recommended for consideration of intermittent monitoring per AAP guidelines,6 including those who had (1) a preterm birth (<37 weeks’ gestation); (2) severe underlying cardiac or pulmonary disease (eg, bronchopulmonary dysplasia, asthma/reactive airway disease, or congenital heart disease); (3) an initial admission to the pediatric intensive care unit (ICU); (4) a history of treatment with palivizumab; (5) a diagnosis of immune deficiency, hematologic dyscrasia, or cancer; and (6) received chronic immunosuppressive therapy. To minimize the enrollment of infants and young children who were not hospitalized within the past 24 hours for acute bronchiolitis, we excluded infants and young children who (1) received corticosteroids within 14 days of admission, (2) had a history of responding to treatment with albuterol sulfate at home, or (3) were transferred from an outside facility where the patient was hospitalized for 12 hours or longer. Finally, infants and young children were excluded if (1) their admitting physician refused to adhere to the study protocol, (2) they were previously enrolled in our study, or (3) their family was unable to give informed consent in English. Study personnel screened admission logs during peak periods of respiratory virus infection prevalence (October through April of each study year) for eligible participants. Personnel then contacted the primary treating physicians of potential participants to assess their willingness to abide by our study protocol prior to approaching the families to obtain written informed consent. Institutional review board approval for our study was obtained at all participating study sites individually. Parents provided written informed consent prior to patient enrollment. A data safety monitoring board reviewed interim and final study data on primary and secondary outcomes. No safety issues were identified as part of this study. Eligible participants were sequentially randomized at each site to undergo continuous or intermittent pulse oximetry monitoring. Owing to resource limitations, the screening of participants was performed on weekdays during normal business hours, and site 2 screened and enrolled participants only at a 36-bed community-based facility. Each site was provided a randomized sequence of intervention assignments, and the participants were enrolled in strict chronological order of hospital admission each day. Parents/guardians were blinded to allocation assignment until informed consent was obtained; study personnel and outcome assessors were not. Continuously monitored patients were placed on the pulse oximeter immediately after randomization (if not already in place) and were continuously monitored throughout the hospitalization, regardless of oxygenation status. Patients randomized to intermittent monitoring could only enter the intermittent phase of monitoring when they were deemed nonhypoxemic, which was defined as having an oxygen saturation level of 90% or higher. Patients randomized to intermittent monitoring underwent pulse oximetry monitoring (1) when their vital signs were being evaluated as scheduled at the physician’s discretion, (2) if clinically significant deterioration was suspected by health care personnel, or (3) upon parental/guardian request. The intermittent monitoring procedure was initiated immediately after obtaining informed consent, which could involve the discontinuation of continuous monitoring if previously ordered. If the patient was found to have an SpO2 of less than 90% during a spot check, then he or she was monitored continuously for 5 minutes to determine whether hypoxemia was transient. The observation period was waived if oxygenation dropped below 80%. Intermittently monitored patients identified as persistently and/or moderately hypoxemic based on the abovementioned criteria would then be continuously monitored and receive supplemental oxygen to achieve an initial SpO2 of 92% or higher for at least 1 hour before initiation of weaning of supplemental oxygen. Patients in both study arms who required supplemental oxygen underwent a standardized weaning protocol (eAppendix in Supplement 2). Intermittent monitoring was resumed for patients after documentation of an SpO2 higher than 90% in room air for at least 1 hour. Patients in both study arms would otherwise receive care for bronchiolitis based on local practice for each study site. Enrolled patients who were transferred to the ICU exited study protocol but had all relevant study data collected for analysis. Quiz Ref IDThe primary outcome measure was LOS, measured in hours, which is defined as the time from admission to the inpatient unit to hospital discharge. Secondary outcome measures included duration of supplemental oxygen use and rate of escalation of care (defined as transfer to an intensive care unit). Study personnel also obtained data on laboratory testing; medication use; receipt of intravenous hydration; performance of nasopharyngeal suctioning; presence of fever; potentially relevant medical, social, and family history; and presenting symptoms at admission. Sample size calculations were performed using Power and Sample Size Calculator, version 3.0 (by developers William D. Dupont and Walton D. Plummer Jr),8,9 based on data obtained from a previous retrospective study of patients hospitalized for bronchiolitis performed at 2 of the study sites.10 Based on a previously identified mean LOS of 65.3 hours, we estimated that we would need to enroll 80 patients in each study arm to provide an adequate sample size to detect a difference in mean LOS of 18 hours with 80% power and α = .05. Smaller differences in LOS were determined to be less likely to result in a change in actual duration of hospitalization because decisions regarding hospital discharge are typically made once daily at these institutions.11 We repeated our power calculation post hoc, using observed standard deviations and actual study enrollment numbers. Differences in LOS were compared between study arms using the Mann-Whitney U test and the Kaplan-Meier method. We confirmed the results of these tests, controlling for study site and random baseline differences identified between study arms, by examining the relative probability of hospital discharge over time using a Cox proportional hazards model,12 with 95% CIs calculated. All analyses were conducted using the intention-to-treat population, which included patients who were transferred to the ICU during their hospitalization or were enrolled and subsequently exited the study protocol for any reason. Patient-level characteristics were compared between study arms using the Pearson χ2 test for categorical variables, the Mann-Whitney U test for nonnormally distributed continuous variables, and the t test for normally distributed continuous variables. Statistical analyses were performed using Stata version 13.1 for Windows (StataCorp). A total of 161 patients were enrolled in our study (Figure 1). Baseline demographics and clinical presentation criteria are detailed in Table 1. Two patients randomly assigned to intermittent monitoring exited the study protocol owing to withdrawal of parental consent/request, but all clinical data for these patients were collected and included in all analyses. Patients in the continuous monitoring arm were slightly younger than those in the intermittent monitoring arm (median age, 0.22 years [interquartile range, 0.13-0.44 years] in the continuous arm vs 0.3 years [interquartile range, 0.15-0.64 years] in the intermittent arm). More patients in the intermittent monitoring arm than in the intermittent monitoring arm received corticosteroids (5.0% of patients in the continuous arm vs 15% of patients in the intermittent arm) and antibiotics (13% of patients in the continuous arm vs 26% of patients in the intermittent arm) in the emergency department before admission. More continuously monitored patients than intermittently monitored patients were admitted to a hospitalist service (77% of patients in the continuous arm vs 63% of patients in the intermittent arm). There was no difference in LOS between the 2 arms (mean difference in LOS, 2.7 hours [95% CI, −7.6 to 13.0 hours]). Although patients who stayed in the hospital between 50 and 100 hours were discharged slightly more frequently in the intermittent arm than in the continuous arm, this difference was not statistically significant (Figure 2). This finding was confirmed in Cox regression analysis, controlling for random baseline differences, including admitting physician service, patient age, study site, and receipt of corticosteroids and antibiotics in the emergency department (hazard ratio, 0.95 [95% CI, 0.69-1.31]). Our post hoc power analysis using observed standard deviations and actual study enrollment, with a 2-sided α = .05, showed that our study had 95% power to detect a difference of at least 18 hours (a priori–defined clinically meaningful difference in LOS), if present. Conversely, using our observed difference in LOS and the exact same study design, we would need to enroll 2343 patients in each study arm to detect a statistically significant difference in LOS. Secondary clinical outcomes are summarized in Table 2. Duration of oxygen therapy and rate of transfer to an ICU setting did not differ between the 2 groups. No deaths occurred among study participants. Rates of performance of laboratory studies, medical therapies, and treatment procedures did not differ between the 2 groups. Quiz Ref IDOur randomized trial of 2 different inpatient pulse oximetry monitoring strategies for nonhypoxemic infants and children with bronchiolitis found no effect on LOS. Furthermore, there were no differences in ICU transfers or duration of oxygen supplementation, and no differences in laboratory or therapeutic interventions by virtue of assigned monitoring technique. Infants randomly assigned to continuous monitoring were slightly younger than those randomly assigned to intermittent monitoring. Younger infants would be expected to have a longer LOS compared with their older counterparts13; however, LOS remained similar between study arms when we accounted for this baseline difference using Cox regression analysis. Several factors might explain why intermittent pulse oximetry did not shorten LOS in our study. In prior retrospective studies suggesting that pulse oximetry prolongs hospitalizations, the mean LOS was considerably longer than the LOS in our study (3.0-3.5 days vs 2 days). In those studies, the oxygen saturation thresholds were either higher than ours (>93% in Unger and Cunningham4) or not standardized (Quinonez et al7). Therefore, an intermittent monitoring strategy may be more likely to have an effect on LOS in settings where a less permissive approach to hypoxemia is adopted. Furthermore, the choice in our study to institute intermittent oximetry only after patients were no longer receiving supplemental oxygen may further explain our discrepant results. Finally, our study was powered to detect an 18-hour difference in LOS, which, in retrospect, is potentially too large of an incremental effect to expect from any intervention in a cohort with a 40-hour median LOS. The definition of hypoxemia that we chose for the present study (SpO2 < 90%) is not universally accepted; however, it is the definition used in the AAP guideline and the one for which evidence exists to suggest an effect on LOS. Specifically, in an observational study of hospitalized infants,14 it was estimated that LOS could be reduced by 22 hours by changing the oximetry threshold for discharge from 94% to 90%. It is possible that the uniform acceptance of the 90% saturation threshold in the 4 study sites was a factor in producing our shorter-than-expected LOS. Pulse oximetry remains a controversial element of care in pediatrics because there is tension between the assertion that missing, clinically unapparent hypoxia could have a significant negative effect on infants with bronchiolitis and the belief that monitoring may result in unnecessary hospitalizations and a prolonged LOS. In a recent randomized trial3 in which 1 pulse oximeter was manipulated to read 3 percentage points above the actual reading, this single factor resulted in significantly higher hospitalization rates and longer emergency department stays in the true oximetry group when controlling for other risk factors (adjusted odds ratio, 4.0). Despite less hospital care in the altered pulse oximetry group, there were otherwise no differences in outcomes. This trial3 provides the strongest evidence to date that pulse oximetry can be linked to unnecessary hospitalizations. Hence, the risk of an infant with bronchiolitis having an adverse event related to an unnecessary hospitalization is an important consideration in this debate, with at least 1 study19 noting a 10% adverse error or near-miss rate for harm-causing interventions during pediatric hospitalizations. Finally, the pulse oximeter is likely the most frequent alarm to sound in the room of an inpatient with bronchiolitis. Previous studies have reported that alarm fatigue leads to neglect of desaturations in adults.20 Further studies assessing the potential negative consequences of continuous oximetry use, particularly in terms of nursing behavior and patient sleep patterns in hospitals, could inform the current debate. Quiz Ref IDOur study had significant limitations. Patient randomization often occurred hours after admission, as patients were screened, provided consent, and enrolled during daytime business hours. Consequently, patients admitted after hours experienced a significant delay in implementation of the assigned monitoring strategy, and this delay was not accounted for when LOS was recorded. Next, the frequency of pulse oximetry checks for children in the intermittent monitoring arm varied by patient and site, as the study protocol specified checks with vital signs and per nursing shift. The number and timing of pulse oximeter checks were not recorded, and thus this variation could not be taken into account. Our study also does not address the effect that intermittent pulse oximetry monitoring could have on clinical outcomes if used for patients even while receiving supplemental oxygen, although we suggest that such a strategy could be reasonably considered in future studies. Finally, although we achieved our goal sample size for our primary outcome, our study was not designed to detect differences in secondary outcomes, particularly ICU transfers. Intermittent pulse oximetry monitoring of infants and children hospitalized for uncomplicated bronchiolitis did not decrease LOS when used for patients no longer receiving supplemental oxygen. Our results suggest that intermittent pulse oximetry monitoring can be routinely considered in the management of children hospitalized for bronchiolitis who show clinical improvement. Accepted for Publication: May 27, 2015. Corresponding Author: Russell McCulloh, Department of Pediatrics, Children’s Mercy Hospital, 2401 Gillham Rd, Kansas City, MO 64108 (rmcculloh@cmh.edu). Published Online: August 31, 2015. doi:10.1001/jamapediatrics.2015.1746. Author Contributions: Dr McCulloh had full access to all of the data in the study and takes responsibility for the integrity of the data and the accuracy of the data analysis. Study concept and design: McCulloh, Ralston, Hill, Koehn, Alverson. Drafting of the manuscript: McCulloh, Ralston, Alverson. Administrative, technical, or material support: McCulloh, Koster, Johnson, Weddle. Study supervision: McCulloh, Hill, Alverson. Funding/Support: This study was funded by an Early Career Award from the Thrasher Foundation. We also thank Rhode Island Hospital for research funding. Role of the Funder/Sponsor: The funding organizations had no role in the design and conduct of the study; collection, management, analysis, or interpretation of the data; preparation, review, or approval of the manuscript; and decision to submit the manuscript for publication.